A SUNY Cobleskill Equine Science graduate, Andrea is a PATH International and CHA (Certified Horseman’s Association) certified instructor, an EAGALA (Equine-Assisted Growth and Learning Association) Certified Equine Specialist, and completed the Pennsylvania Council on Therapeutic Horsemanship Instructor Course. 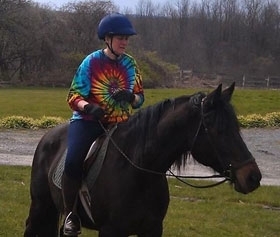 Andrea provides therapeutic riding lessons and Common Ground Natural Horsemanship training, offers educational workshops in the community, and co-teaches a three-credit course in equine-assisted activities and therapies (EAAT) at Syracuse University, with Paul Caldwell, MSW, PhD. Andrea is also a National Strength and Conditioning Association Certified Personal Trainer, and her dedication to connecting her passion for health and quality of life led her to co-found From the Ground Up in 2002. Nadine has been with From the Ground Up for more than ten years, in many roles and through the organization’s many changes. She is a skilled, veteran lesson volunteer herself, as well as the coordinator of volunteers. She handles horses at most horse-related activities, and is also the President of the FTGU Board of Directors, where her decades of organizational experience at Syracuse University have helped guide the many aspects of a not-for-profit business. Nadine is the point person for many FTGU events, which she always enhances with photographs, posters, handmade button pins and other extra touches. And most of all, she is a ceaseless ambassador and cheerleader for the programs FTGU provides to the community. She is, quite simply, vital to FTGU’s success. Chris has been around horses most of his life. He has worked with many different horses from race horses to draft horses, and even spent a couple of years on a ranch in the Arizona Painted Desert. 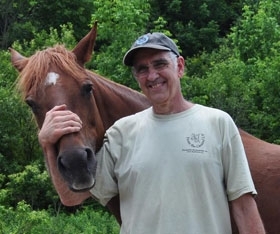 Chris’s interest in Therapeutic Horsemanship started in 2000, and he is a co-founder of From The Ground Up, a lesson and horse care volunteer and Board Member. He has also been a Special Olympics Coach for the Central region Equestrian team. And beyond anyone else’s abilities, Chris handles all issues mechanical and technical around the farm. Cathy received a Riding Master certificate in English from Meredith Manor, School of Horsemanship in Waverly, West Virginia, and remained as a staff member after receiving her Teaching Master certificate. 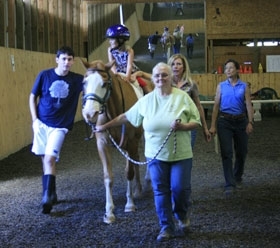 Cathy worked in the horse industry for the past 30 years in roles of barn manager and riding instructor in West Virginia, Rhode Island, Connecticut and New York. She ran the riding program for the Girl Scouts of America summer camp in Rhode Island, was Assistant Manager for Johnson & Wales College Equine program in Rhode Island and worked for many years as an instructor and manager at Kelsey’s Farm in Greenwich, Connecticut, a Pony Club orientated stable. After moving back to Central New York, Cathy began volunteering at From The Ground Up and subsequently became a PATH International Certified Instructor. Paul has been on the faculty of the School of Social Work at Syracuse University since 1994, and previously worked for 16 years in various human services and mental health treatment settings. 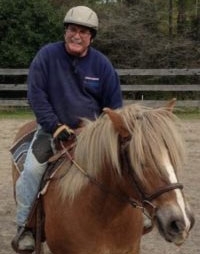 He has been affiliated with From the Ground Up since 2011, and is a lesson and horse care volunteer and Board member. He also provides, with FTGU Director Andrea Colella, EAGALA services, community-based educational workshops, and a three-credit course in equine-assisted activities and therapies (EAAT) at Syracuse University.